The wood duck is clearly one of North America’s most beautiful waterfowl. As is commonly the case in birds, the male’s plumage is more colorful than the female’s. It is approximately 19 inches long with a wingspan of approximately 28-39 inches. Monogamous for the breeding season, wood ducks’ lifespans are about four years. Their diet consists of invertebrates and small fish. Adults prefer plants, seeds, and aquatic and land invertebrates. 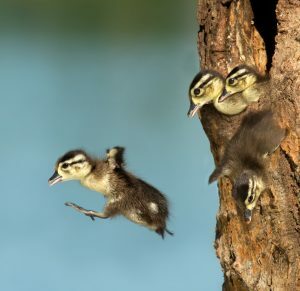 Because they nest in tree cavities, wood ducks are one of the few species of waterfowl with strong claws on their webbed feet, designed for climbing bark. Other cavity nesters include bufflehead, goldeneye, and mergansers. 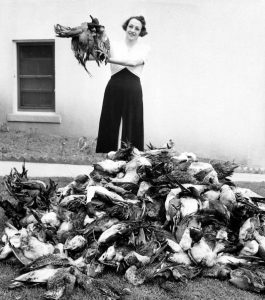 Wood ducks were driven to near-extinction by habitat loss and market hunters in the late 19th and early 20th centuries. These waterfowl were especially vulnerable because they roost in groups. The Migratory Bird Treaty Act of 1816 has since protected and controlled bird populations. Hunting regulations and conservation measures, spearheaded by hunters, have been helping wood duck numbers to recover. An additional factor in the decline of the wood duck population was the loss of our country’s mature forests. During the Industrial Revolution trees were cut for cordwood to fire the furnaces that ran machines in US factories. Few ancient forests remain in North America; in fact, Bear Swamp is the only primeval forest in Southern NJ. Urban sprawl has also diminished forested habitat for cavity nesters. Because old forests are rare, larger cavity-nesting birds like wood ducks find it especially difficult to find sizeable trees to incubate their eggs Today conservationists have established man-made nesting box programs to mitigate this loss. Just one day after hatching, young wood duck chicks leave the nest. 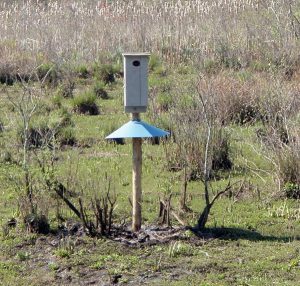 CU Maurice River has constructed a number of nesting boxes for wood ducks and has had some success attracting the species. The female incubates for 28-37 days. One behavior adopted by female wood ducks is called dumping, where they lay eggs in another wood duck’s nest employing a strategy of surrogate parenting. Clutches are normally 8-15 eggs but dumping could increase this to a number beyond successful incubation. Records as high as 40 have been recorded. Most wood ducks have one brood per season but occasionally two will be reared. The chicks will fledge (fly) in 56-70 days. After hatching, the young only stay in the nest 24 hours before exiting. Young have been known to leap from nesting sites as high as 60 feet. Watch a video from one of our duck cams showing the mass exodus. At first the female sits in the nesting box’s opening, making sure that no intruders are evident. When the departure takes place it is a very speedy exit. • Support conservation groups’ nesting box programs. • When safe, leave dead trees standing. • Buy a duck stamp – the easiest way for you to participate in wildlife and habitat conservation. • If you hunt, obey game regulations. • And PLEASE do not feed wildlife. Food other than their natural diet causes illness and deformities, and develops unsafe dependencies on people. Feeding also attracts larger numbers, creating an unsanitary and unhealthy environment.